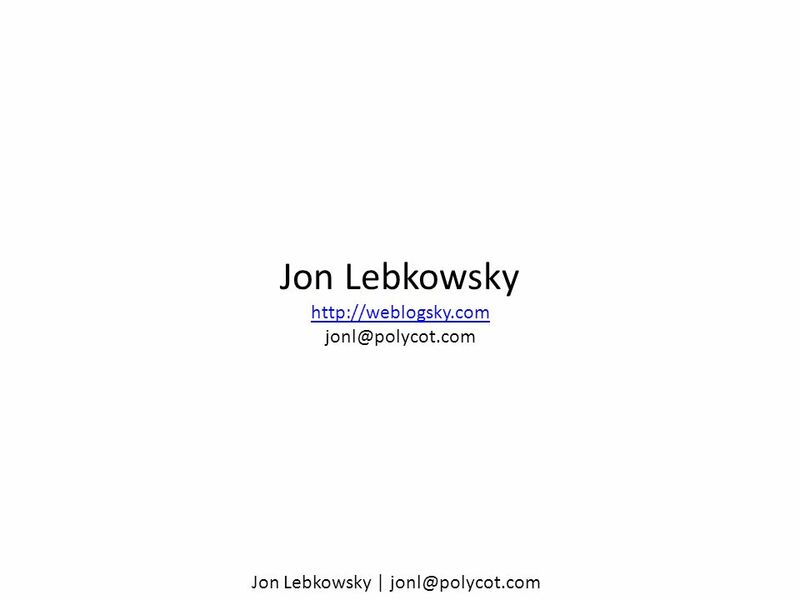 12 Jon Lebkowsky | jonl@polycot.com Its all about data. 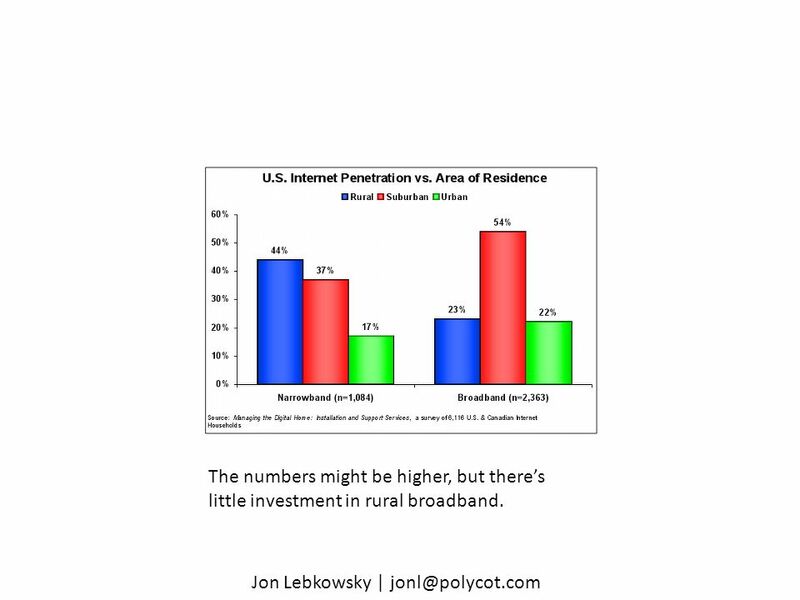 15 Jon Lebkowsky | jonl@polycot.com The numbers might be higher, but theres little investment in rural broadband. 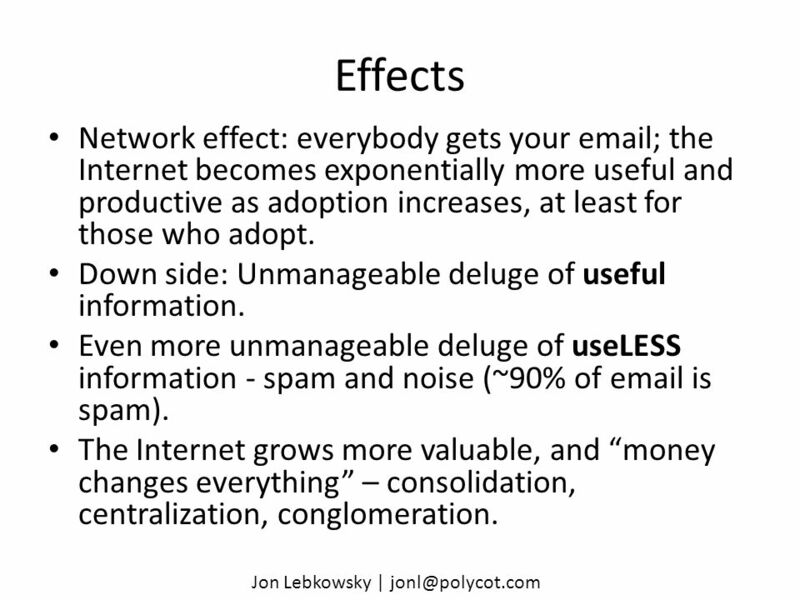 17 Jon Lebkowsky | jonl@polycot.com Effects Network effect: everybody gets your email; the Internet becomes exponentially more useful and productive as adoption increases, at least for those who adopt. Down side: Unmanageable deluge of useful information. Even more unmanageable deluge of useLESS information - spam and noise (~90% of email is spam). 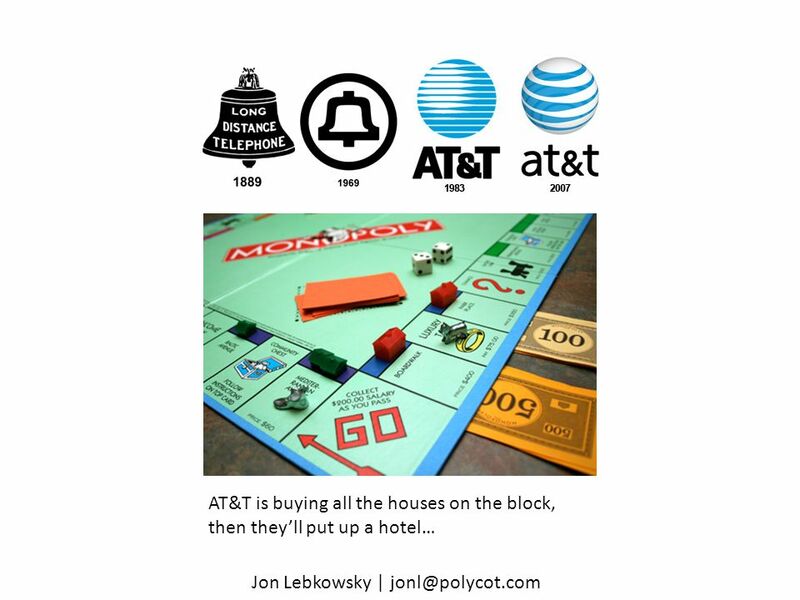 The Internet grows more valuable, and money changes everything – consolidation, centralization, conglomeration. 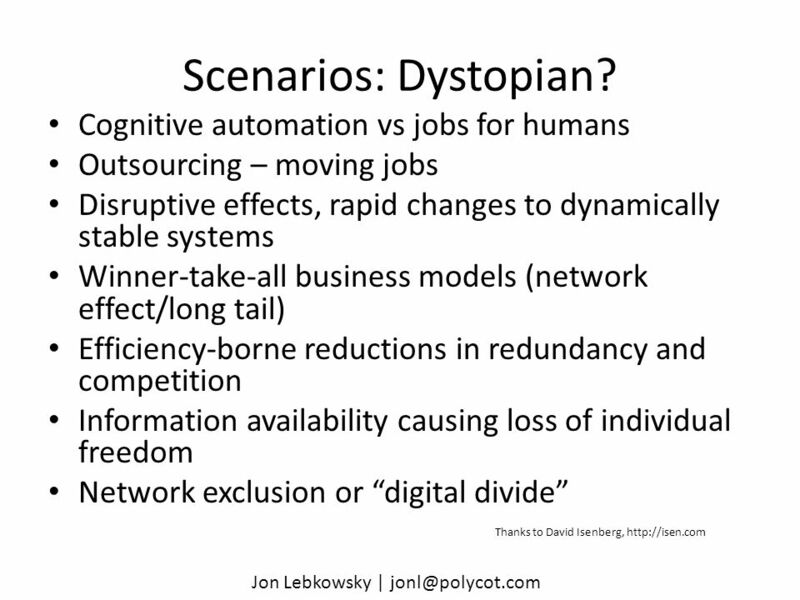 19 Jon Lebkowsky | jonl@polycot.com Future Scenarios: Network Internet: Free and open network of networks, end to end principle, dumb network. Facilitated by Freedom Box? Cable television: limited selections delivered with a high quality of service. Relatively high barrier to entry on the content side. Balkanized hybrid: walled gardens and pay walls plus low-bandwidth, lower-value everything else; providers and users pay for higher QoS. 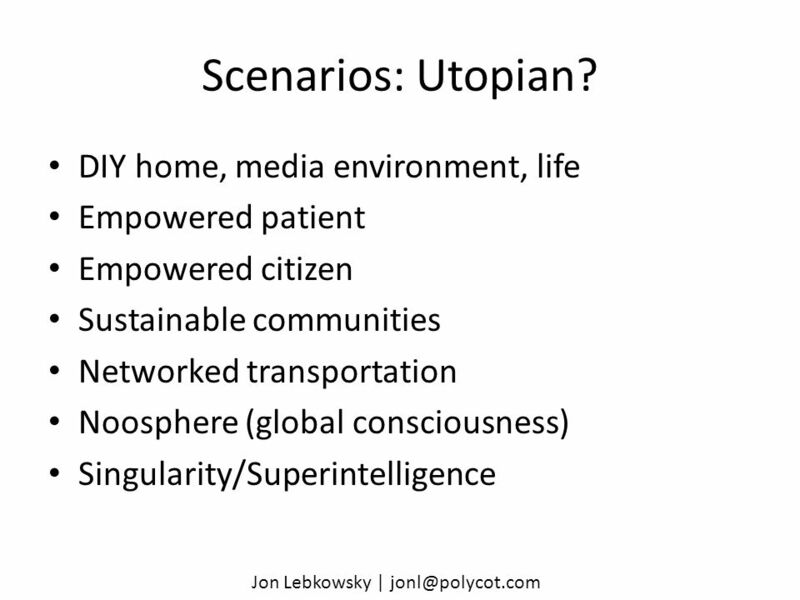 23 Jon Lebkowsky | jonl@polycot.com How should we experience the Internet? 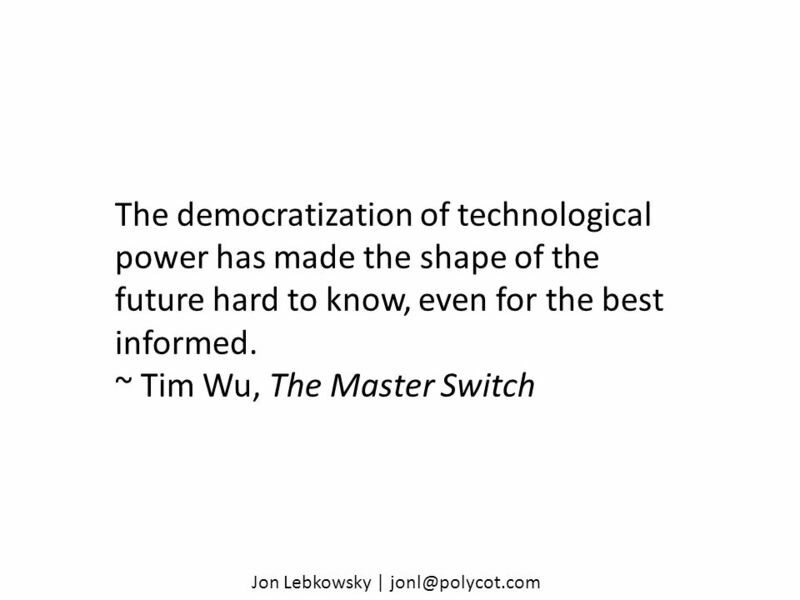 Should our Interface with the world and its data be owned and controlled by corporations? Operated as public utilities? 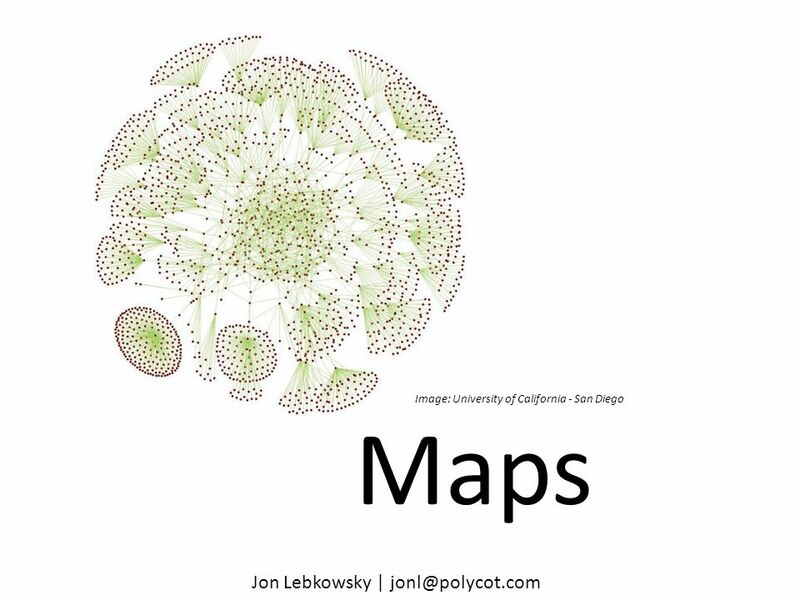 Or distributed? 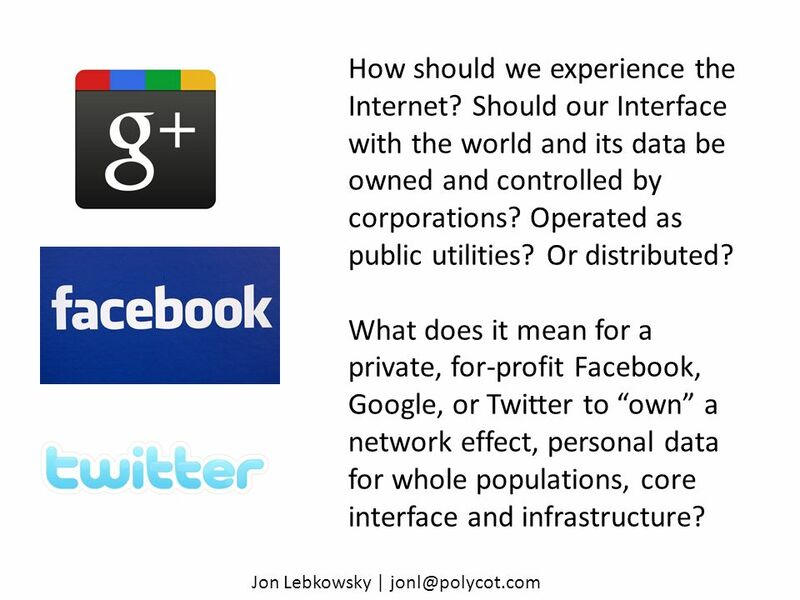 What does it mean for a private, for-profit Facebook, Google, or Twitter to own a network effect, personal data for whole populations, core interface and infrastructure? 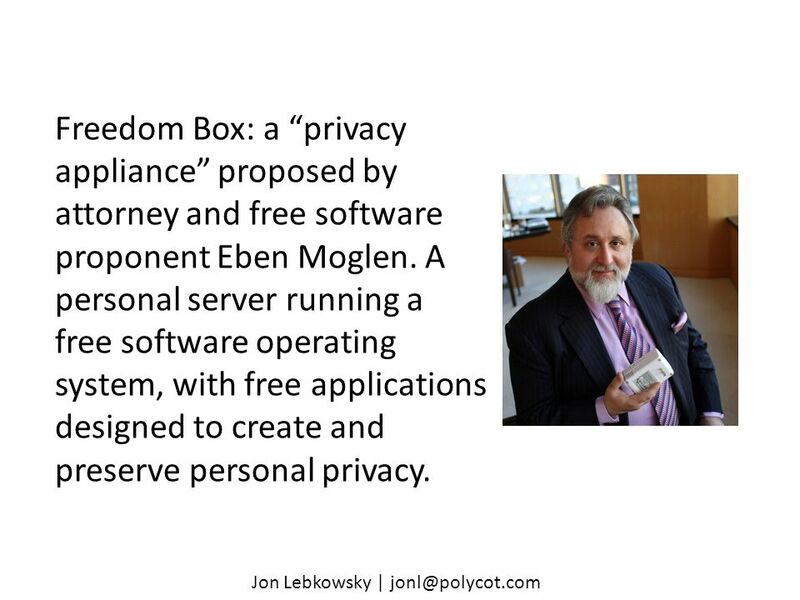 24 Jon Lebkowsky | jonl@polycot.com Freedom Box: a privacy appliance proposed by attorney and free software proponent Eben Moglen. A personal server running a free software operating system, with free applications designed to create and preserve personal privacy. 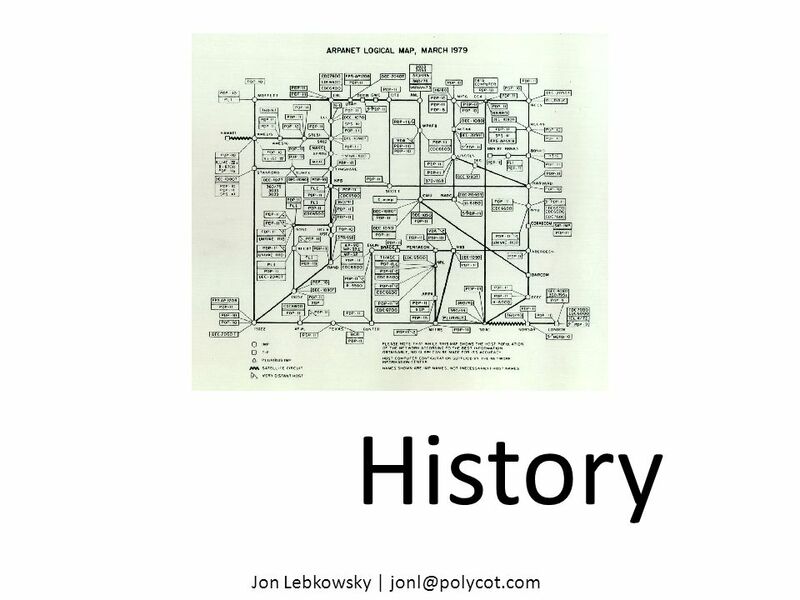 25 Jon Lebkowsky | jonl@polycot.com Questions Identity: who has a right to your data? How do you manage the manifestation and use of your identity online? Power: who has authority for a relationship? 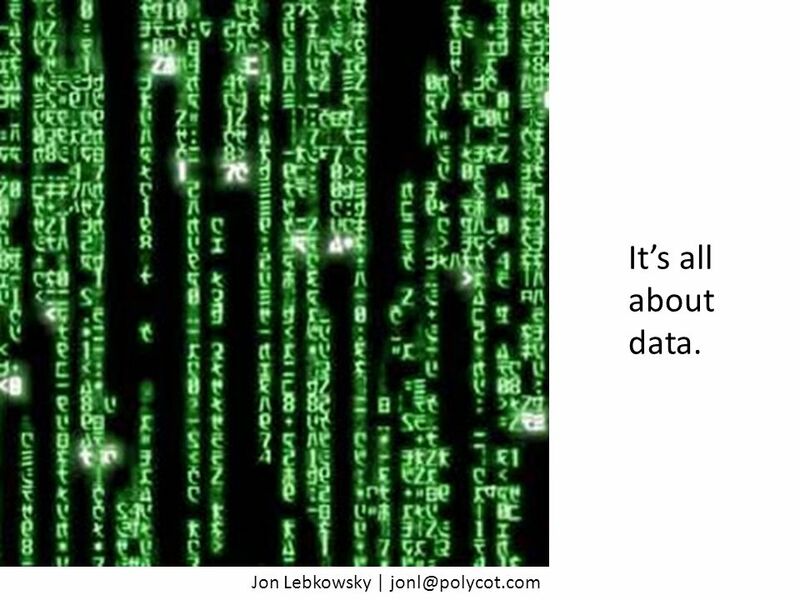 Example: vendor/customer – who has a right to the data, to manage the relationship? 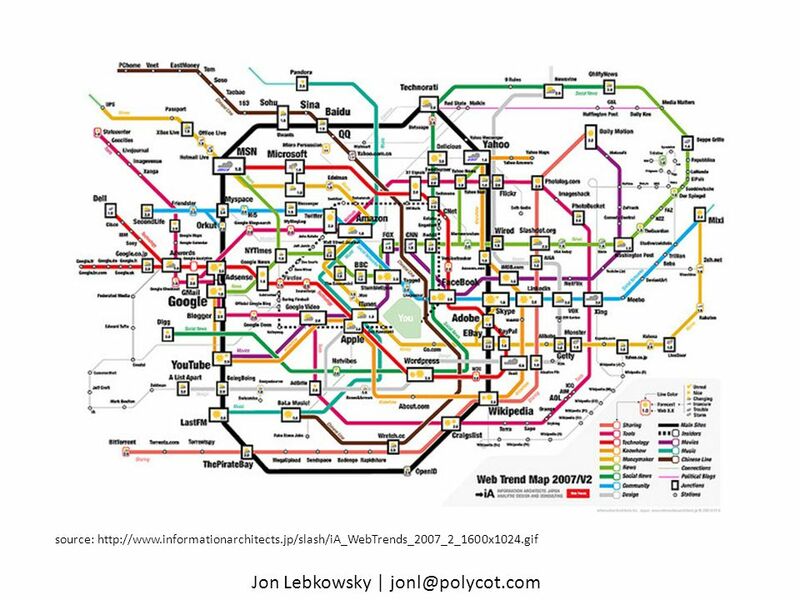 Abundance: how do you manage information and sustain an accurate world perspective with literally millions of potential information channels? 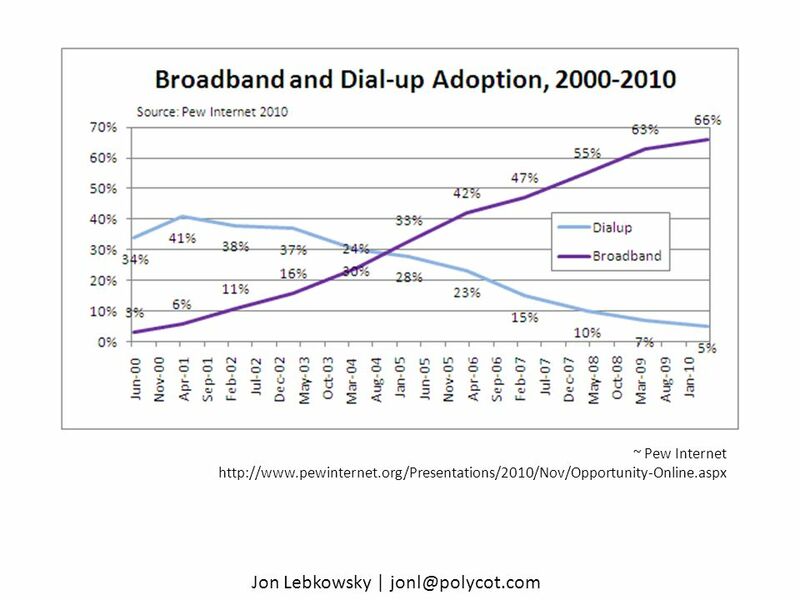 Access/Bandwidth: what is the appropriate role/business of the broadband service provider? 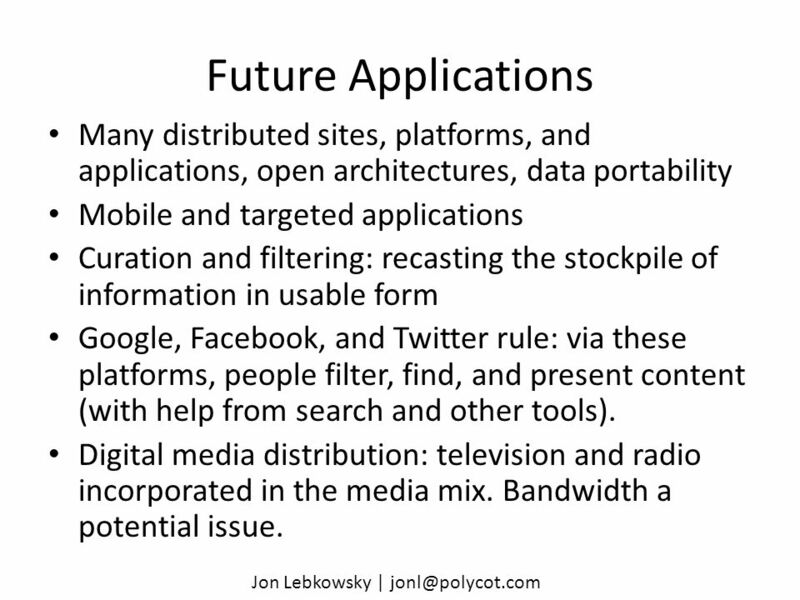 26 Jon Lebkowsky | jonl@polycot.com Future Applications Many distributed sites, platforms, and applications, open architectures, data portability Mobile and targeted applications Curation and filtering: recasting the stockpile of information in usable form Google, Facebook, and Twitter rule: via these platforms, people filter, find, and present content (with help from search and other tools). Digital media distribution: television and radio incorporated in the media mix. Bandwidth a potential issue. 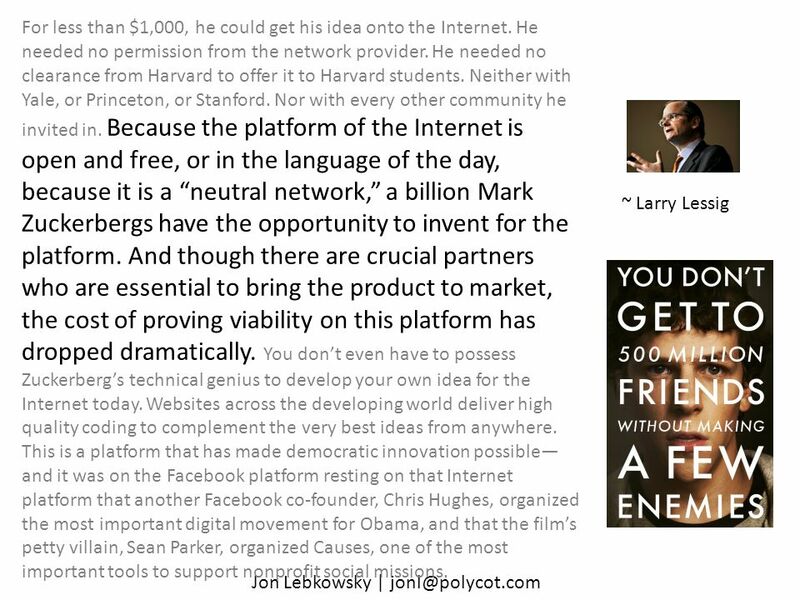 Download ppt "Jon Lebkowsky | The Future of the Internet Concept by Mac Funamizu, of-internet-search-mobile-version/http://petitinvention.wordpress.com/2008/02/10/future-"
SWEB122: Advocate Portal Roundtable November 7, 2008. 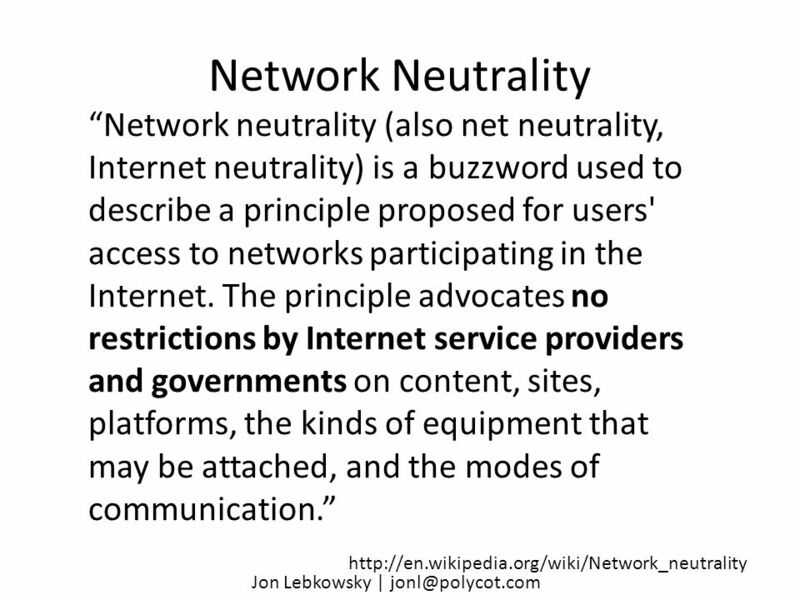 All rights reserved © 2006, Alcatel Grid Standardization & ETSI (May 2006) B. Berde, Alcatel R & I. Session 4a, 6 May 2009 IST-Africa 2009 Copyright 2009 Digital World Forum W3C Mobile Web for Social Development Program (MW4D) Stéphane Boyera W3C France. I N T E R N E T.
Develop the idea of protocols by modelling a computer network with the children as client machines and the teacher as the server. Pass messages around. Grow your business with your head in the cloud. What is Cloud Computing ? 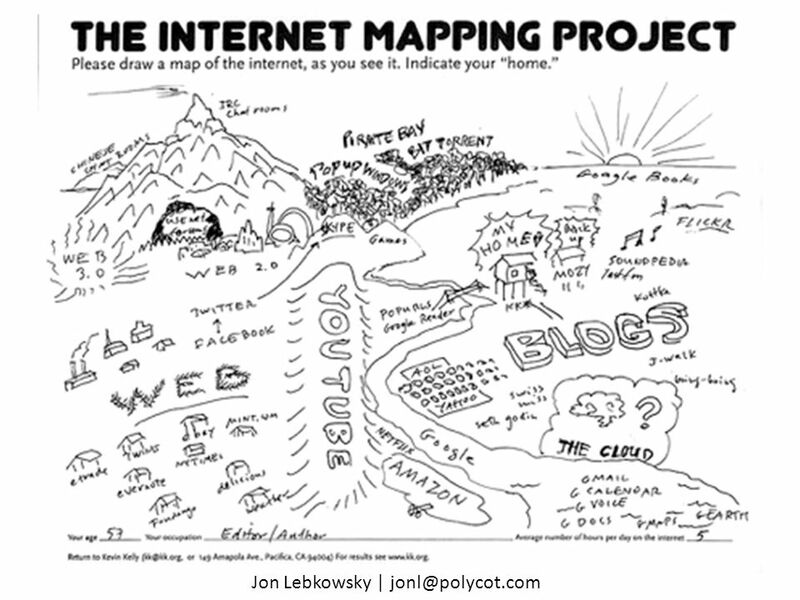 Internet-based computing, whereby shared resources, software and information. Consumer Benefits of Cloud Delivered Content DCIA Content in the Cloud CES. 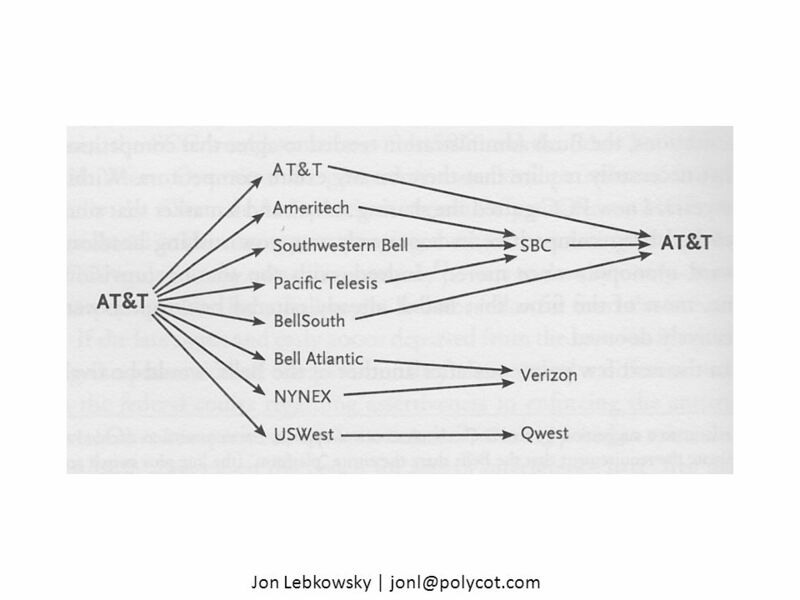 Network Centric World. 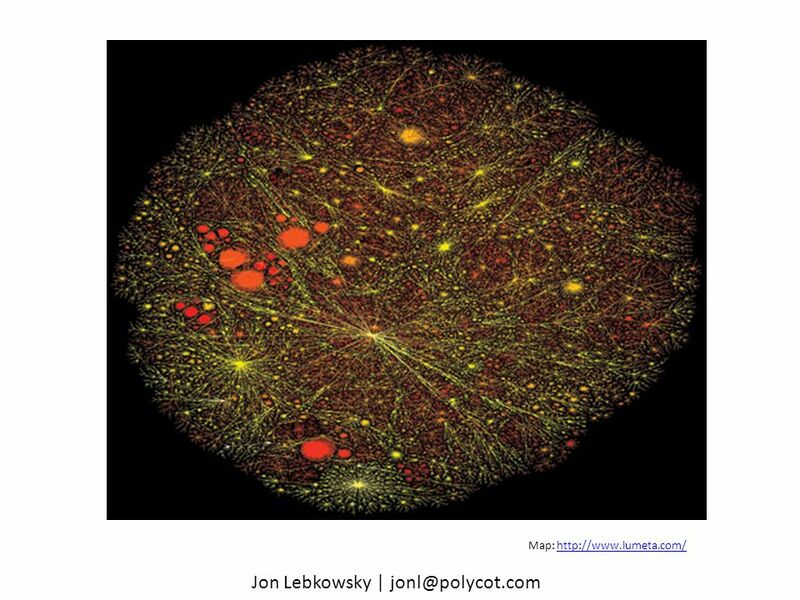 Rick Graziani Networks in the way we work Networks are no longer just a luxury, but a necessity in conducting. 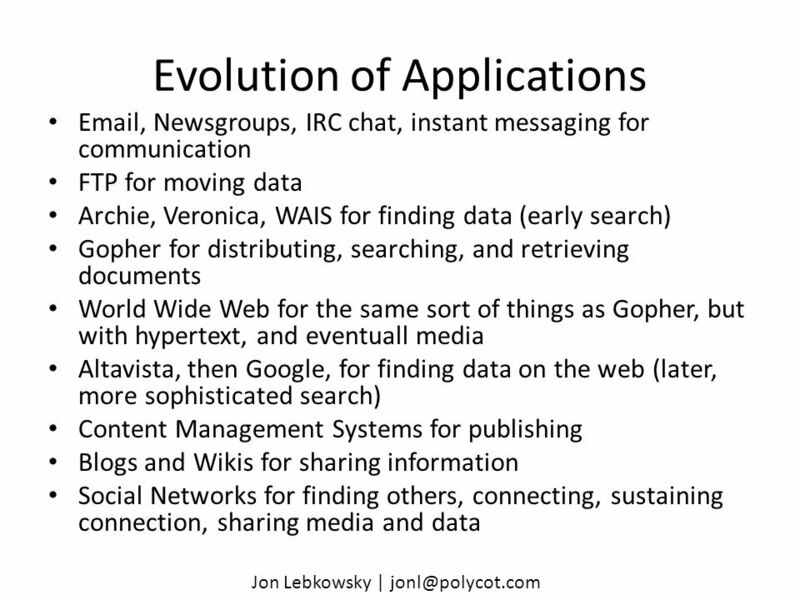 Internet Research Internet Applications. 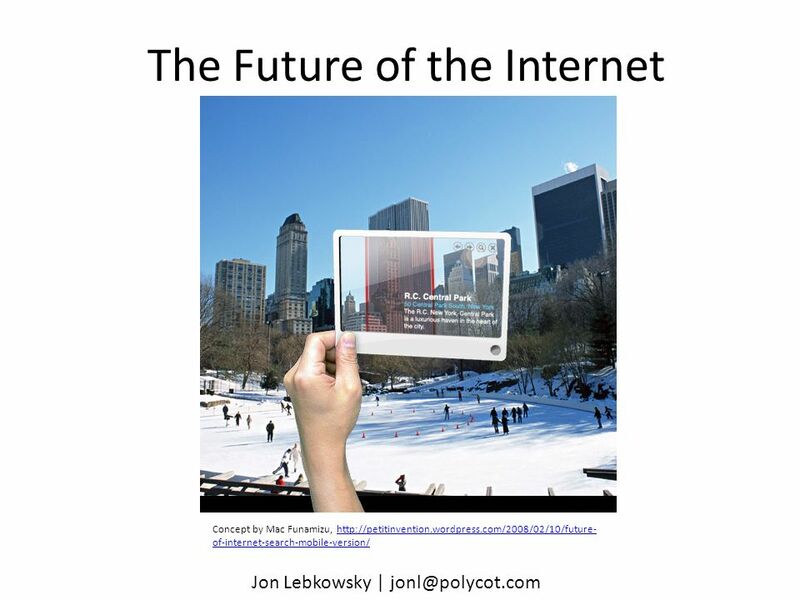 The Internet is not the Web Because of the great popularity of the World Wide Web, people think the Internet. Digital Content Solutions Digital content management technology has transformed the way to manage content and knowledge, in this knowledge era. Research. Using the Internet: Making the Most of the Web’s Resources James B. Dang Associate Professor/Department Chair of Computer Science Southeast Campus. 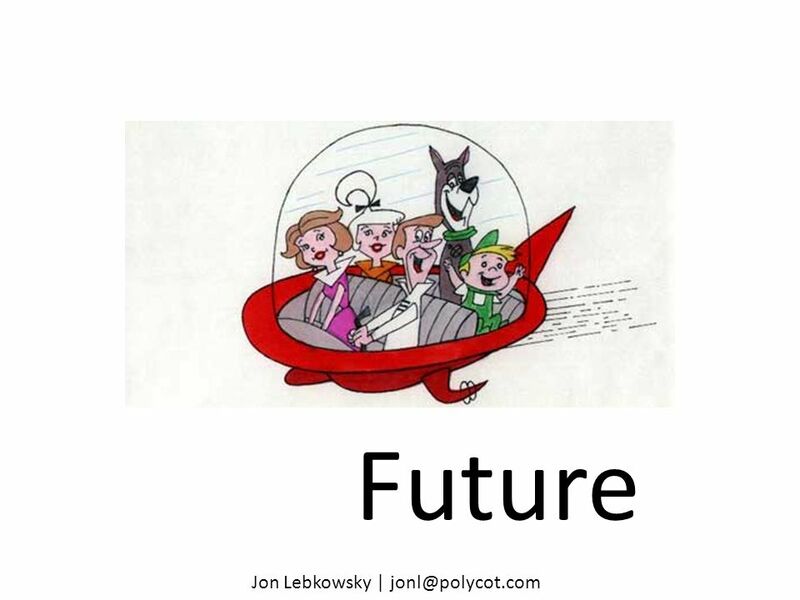 © 2013 by the McGraw-Hill Companies, Inc. All rights reserved. Chapter 5A The Internet. E-commerce E-commerce is defined "as the process of buying, selling, or exchanging products, services, or information via computer networks, including. Internet basics, Browsers, application, advantages and disadvantages, architecture, WWW, URL, HTML Week 10 Mr. Mohammed Rahmath.